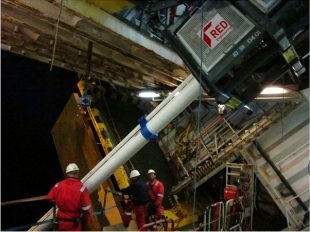 Our Red Engineering team has almost a decade of experience in offshore industries such as oil and gas and renewables, often providing expertise and machinery to remotely install and recover equipment in harsh environments...so it seemed logical to investigate how we could transfer our skills and expertise into the nuclear industry. The NDA’s annual supply chain event proved a great start to making contacts and understanding more about the industry’s challenges. There were more than 1,500 people at the event in Manchester, so it was evident that the opportunities were significant. The whole mission to clean up the earliest nuclear sites spans at least 120 years, so there’s plenty of scope to look at how it can be achieved safer, faster and cheaper. We had a stand in the “innovation zone” and were impressed that the industry is clearly committed to encouraging technological innovation in a constant drive for improvement. The event gave us a real insight into decommissioning challenges and led directly to pursuing opportunities for work at Sellafield. We've delivered very innovative equipment to fixed budgets and tight time scales across over 250 projects. These projects have enabled our clients to reduce risk, save money, reduce schedules and work more safely. 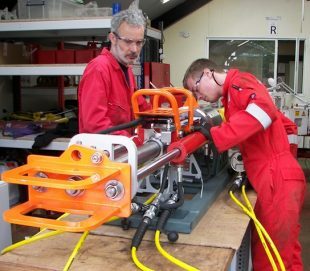 Some highlights of our portfolio include an automated machine to remove the need for manual work for fitting of accessories on to subsea pipelines – this allowed the installation time to be improved by a factor of 5. We saved our client significant vessel time and costs, whilst improving operator welfare. We completed this project from a standing start in less than 12 months and it was a "world’s first", receiving an award for innovation from our client. 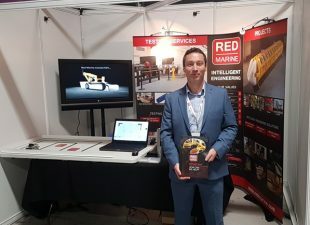 Red Engineering has also pioneered solutions and approaches for using Remote Operated Vehicles (ROVs) to carry out difficult tasks subsea. Part of the ‘art’ of this type of work is to make the approach ‘as simple as possible, but no simpler’ – adding unnecessary complexity adds time and cost, and often limits the probability of success. It is important to have input at the very beginning of a project and work alongside the client to understand and challenge the requirement – we believe this close working relationship is key to ensuring a successful outcome. There are a lot of similar technical challenges between the offshore and nuclear decommissioning sectors, and we are confident that the transfer of approaches and technology will bring some real benefits to the NDA’s mission. Red Engineering was founded in 2008, operating as Red Marine until earlier this year, when we decided to re-brand as Red Engineering to reflect our activity in new developing markets such as nuclear decommissioning. Opportunities such as the NDA Supply Chain Event allow us direct contact with potential client to discuss their needs and communicate our message of how we can help. Just last week, I attended a brokering event for the new competition from NDA and Innovate UK, which is about finding integrated solutions in nuclear decommissioning. 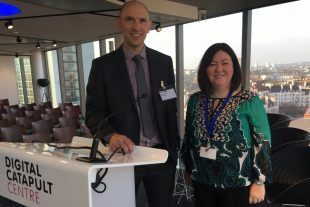 Melanie Brownridge, from NDA, and Chris Hope, from Sellafield Ltd, both made it clear that this competition offers the opportunity to work with more experienced nuclear players so we were interested in exploring how we might fit with what other businesses offer. The NDA and Sellafield Ltd are need to clean up more than 1,000 cells (or rooms) at Sellafield and are looking for an “end-to-end” solution where all the different pieces of technology fit together – which means companies need to collaborate closely. Securing funding support to develop an initial feasibility study as the first phase is hugely important to smaller organisations or new market entrants, who may have limited resources to explore novel ideas. More funds are available for the second phase which is about demonstrating how the new approach would work, and will help businesses to really break into the market. The structure of this competition also promotes to opportunity to work and understand areas outside of our usual competencies – which has allowed us to learn about the direction and potential gains in other areas, which may unlock perceived constraints which we currently work to. It was also refreshing to hear about the willingness to look at risky projects and ideas that may appear to be off the wall – because that will encourage real creative thinking. We’re planning to team up with other companies to find a solution that can be used elsewhere on across the site and really deliver value. We’re confident we have something to bring and welcome the opportunity to demonstrate that. KTN (Knowledge Transfer Network) supports all companies looking for new opportunities through SBRI competitions. Registering for the competition gives access to more information and guidance from KTN, so helps build connections with prospective partners. We’re hoping we can work with other companies or universities who might have different specialist expertise, like virtual reality, radiation measuring, or waste packaging. The brokering events follow a briefing event in London last month which gave an overview of the competition and an introduction to the process. Watch the webinar from this briefing event. What’s inside? How do we get to it? How do we clean it or cut it up? How do we sort and package it?